It all started a few months ago. One day as I was perusing Facebook with our laptop on my lap, I noticed that my legs were very warm. That wasn’t the weird part, though. They stayed warm after I was done – for over an hour. So I stopped computing with the computer on my lap and put it on a desk. Then I noticed that the heels of my palms are the tips of my fingers started getting achy and tingly. Someone strongly suggested ergonomics, but there is no way it’s that. It’s not my muscles that hurt. It’s not like carpel tunnel syndrome. I’ve had that, I know how that feels. It’s an electric, energetic thing, like being zapped at a very low frequency on a part of your body that has a long-lasting result. I decided to look into what was going on. I began learning about EMF’s or electromagnetic fields. I read about people who are sensitive to them and the symptoms they have, which sound a lot like my own. I decided that somewhere along the line I had developed a sensitivity to EMFs. In other words I have what The World Health Organization calls Electromagnetic hypersensitivity (EHS). I noticed that the few times I used my husband’s cell phone my ear got warm and the hand that held it had a burning sensation. My feet, when near the box attached to our laptop’s cord, feel tingly and warm, too. These are the dermatological symptoms. Other EHS symptoms include “neurasthenic and vegetative symptoms (fatigue, tiredness, concentration difficulties, dizziness, nausea, heart palpitation, and digestive disturbances),”1 of which I get the first four to varying degrees. Headaches and anxiety, among other symptoms, are common also. Now that I was paying attention to these things, I realized that we have three computers in our house all powered by Wi-Fi, including our printer. 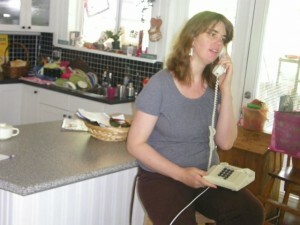 We have three cell phones between three adults, and our main line is cordless. The rest of my household is reluctant to go back to no Wi-Fi. It’s as if life before Wi-Fi could never exist. Now that I am more self-aware, I have noticed that almost each night before bed I get a headache. For a week and a half I have been having trouble sleeping. I have the wireless router and three electronic devices outside my bedroom door, and we are trying to figure out where to move them so that my nighttime exposure is lessened but also so that my kids’ exposure is at a minimum. So far I’ve won one argument. We tossed the cordless, and we’re back to using stationary phones. For the first week I noticed how super inconvenient it is to live plugged back in. I couldn’t help my kids if they were in another room because I was confined to a two-foot radius and actually had to put the phone down (Ack! When was the last time I did that?) to go to them. But then I remembered my university days and my 25-foot cord that twisted its way around the house so I could make my bed, eat my cereal, brush my teeth, and talk on the phone at the same time. So I went to the closest hardware store, half expecting they wouldn’t even be in stock, found one easily, and it makes such a difference. While I try to convince my family to get rid of Wi-Fi, I’ve turned my activist energy towards “Smart Meters,” which our provincial electric company is having installed at B.C. residential addresses without express permission from owners. These meters gauge energy consumption wirelessly, and it is a controversial issue for many reasons. The one that is most important to me is not having a choice whether or not to have a wireless device installed on my property when I believe that the technology is causing me health problems. Unfortunately, because these problems are still rare and not understood, they count for very little. In May 2011, the World Health Organization said that radiofrequency electromagnetic fields are possibly carcinogenic, but without enough proof of health problems to satisfy corporations who want to continue to make money from wireless technology, we are at their mercy. Most of us don’t feel any ill effects from wireless devices, either, so most people wonder, what is there to complain about? Wireless technology makes life so much more convenient. This is true. But when will people realize that convenience doesn’t equal good health? I will always choose my health and my children’s over convenience. It’s just going to take a lot of convincing of many people, including my family, to go back to the old ways. Reviewing the literature points to the same conclusion: that no connection has been found between EMR and the symptoms reported. The WHO and other medical professionals recommend ruling out other potential causes of the symptoms (such as stress-related insomnia, depression, anxiety, etc). It’s also worth mentioning that even a plugged-in, corded telephone produces electromagnetic radiation, both via the electrical cord and via an electromagnet in the earpiece. All electrical appliances produce EMR! Wow. Thank you for writing about this. My step mother used to say there are only 2 things that cause cancer: everything you see and everything you breathe. There are things we can’t see that still aren’t inhaled. Cancer is no small thing… and EVERYTHING is going wireless these days. Good for you for making a change in your home, though I would hazard to guess you feel you have no choice (since it is your health on the line). Ugh, just think of all the teenagers that are constantly sending / receiving text messages! This is a great article and I’m so glad you’re tackling this issue. I’ve been trying (unsuccessfully I might add) for the wireless internet to be taken down at our house. It’s been up for only a year, so obviously we did just fine without it for many years. We don’t have a land-line phone, but I have always at least tried to keep the cell phone put away at a distance when not in use.